To begin the short write-up on this wonderful book,I would like to tell you some thing about Mr.Manojit Das,who co-authored the venture.He happens to meet me at Mysore.Unplanned in every way.Looked sober,humble and brilliant.On exchanging of thoughts,he revealed that he had been pursuing his studies on Cyber crime at Madras university and dispensing services as an ethical hacker too.That makes me intrigued to have his book to give a study,at least for self enlightenment on the much discussed and sought after subject. Mr.Manojit Das rushed the same.Thanks for that.The book covered a lot of information on security challenges emerging from the cyber crime,so vividly with the context of Indian networks.At present,every walk of citizens' life intertwined with the web space,be it e-commerce,online banking or any transaction.All this made us comfortable and the same time vulnerable to the security threats.Right now,even nations keep waging wars online by attacking with their honed up technological advancements.Sea,Land,Air warfare now extended to cyber space. 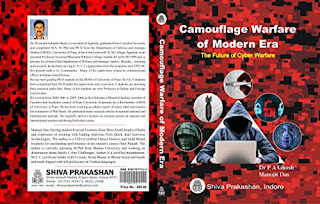 Cyber attacks,the news related to it are being read almost everyday.Our comfort zone turns catastrophic all of a sudden,yes..every possibility is there.Then how to cement the loopholes.How to beware of it and be tackling the given situations,all these were extensively discussed in the book.Sophisticated cybercriminal are increasing to steal the information or destroy critical infrastructure.This publication is very timely with throwing enlightenment on the concerned things.As it puts in the pages of the book,this war carried out today and will be carried out tomorrow. In this era of digitization these types of books are always very helpful, good to know about this book,thanks for sharing. Nice that people are giving serious thoughts to such issues and writing books which are quite relevant to this digital age. This book sounds like the need of the hour. We all need enlightenment in this area.